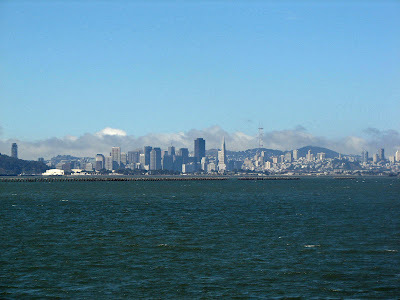 San Francisco from Cesar Chavez Park. 7/20/07. See the beautiful, cooling fog in the back. This evening I take off to Chicago for BlogHer '07. Four days packed full of networking, meetings and parties. I just wrote out my schedule and I'm tired from reading it! Will get home late Sunday and probably spend Monday sleeping and doing laundry. The CraftBlogging community is diverse and large, covering everything from scrapbooking to knitting to other handi-crafts. They use their online communities to collaborate, to provide critiques, to engage in commerce, and simply to learn. How do you find your piece of the CraftBlogosphere? And yes, we'll also talk crafts...our favorite solo and group projects. Leah Petersen moderates the conversation with Kathy Cano Murillo (aka Crafty Chica), Kristin Roach, Natalie Zee Drieu and Amy Sedaris. So look for it here (probably at first chock filled with typos.) My goodness I get to sit at the feet of these women!!! I promise not to swoon. See ya'll on the flip side.